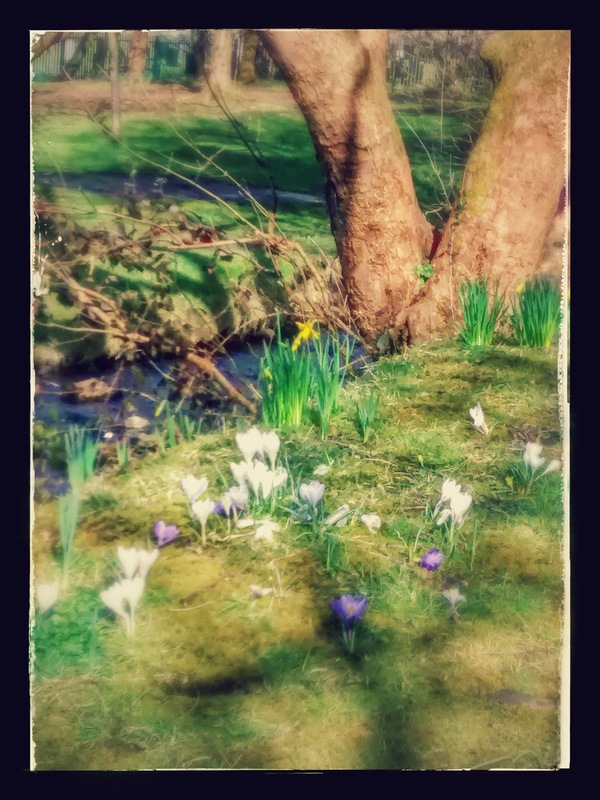 Photo taken today in Jersey Park, pretty Spring flowers and a stream, how idyllic! It has been a very strange week so far... and its only Tuesday, I think!! Never know what day of the week it is anymore since I began working any of the seven days of the week or weeks on and weeks off!! Yesterday, I didn't have to start work until 5pm... sounds good, free until 4.30pm eh! But the clouds were low, damp drizzle and gray skies... and seem to waste the whole day doing something of nothing... Then today, woke up at work... sleep in, that means! And was booked into an all day course, which I turned up at at 9am, for 9:30! Waited and waited... no course, course cancelled, but me not told about it... I had gone back to the house after work, then left after half hour to drive to where the course should have been... so drove back to house, Pippa a second time excited to see me!! Three hours later back in the house, back to Pippa, and this time we went out and stayed out! Long walk down the road and up over the hills and far far away... and back through Jersey Park! Trying to get some practice in before April 22nd and The Kings Walk! I'll never be able to do it otherwise, so much go out again tomorrow... repeat.... I must go out again tomorrow!! Been up hours... Light through yonder window broke about 5:30am... don't care what it says on the net... the sky was light enough to come through the works staff room blind and wake me! And yesterday was awake from 5:55am... Arh!!! 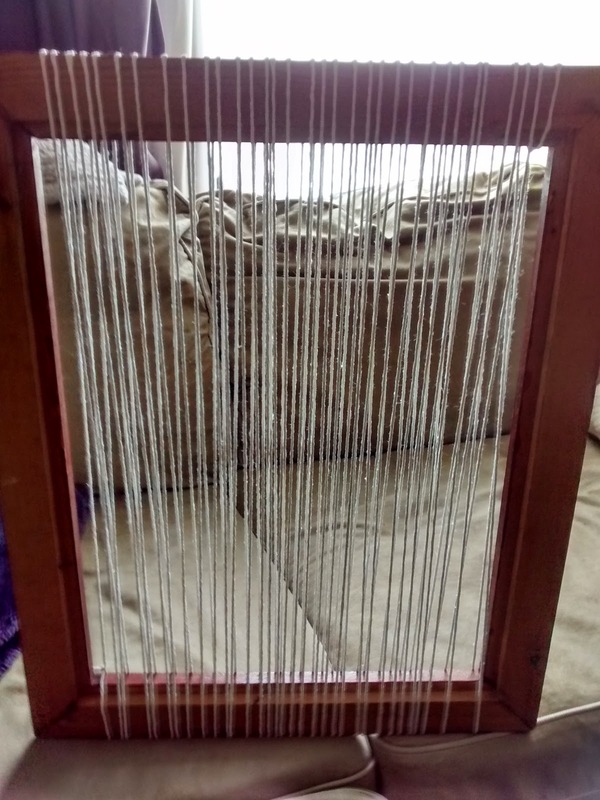 Decided the other week, randomly to give weaving a go!! LOL I know I know! Just call me Rapunzel! My hair is growing long enough soon for a small minion to climb! So, with no loom hanging about the house, who does? 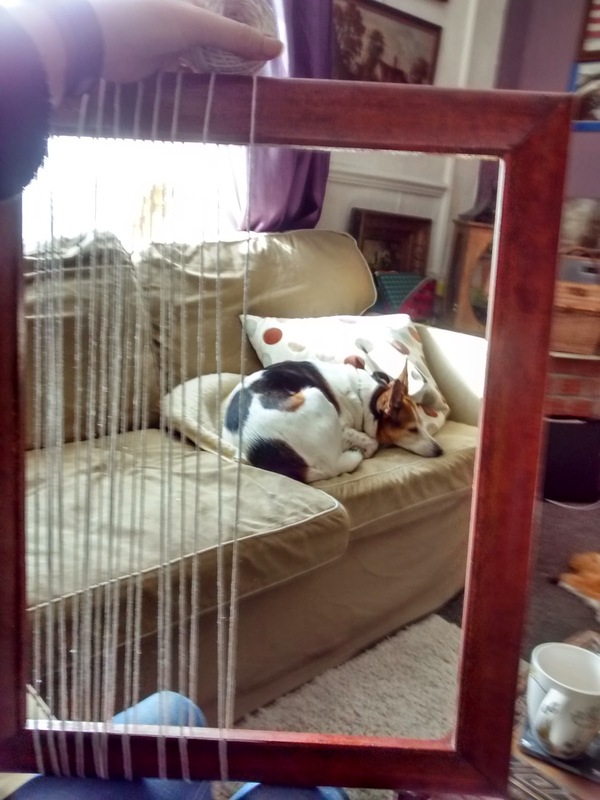 I used an old picture frame of my step-dads, and lo and beyond a loom took shape! Not that Pip was especially bothered! Tired from walk hopefully! I have now completed about an inch, wahoo! I found in my great grandmothers needlework basket a tool for passing the wool etc through and its great! I need to find some different types of materials to use on this my practice piece!